I know many of you will have questions about me, my history, my recovery. This blog was started primarily to discuss my recovery from anorexia and self-harm, the focus being on my recovery rather than the period of time that I was sick. Maintaining all aspects of my health is often challenging due to having bipolar disorder I. 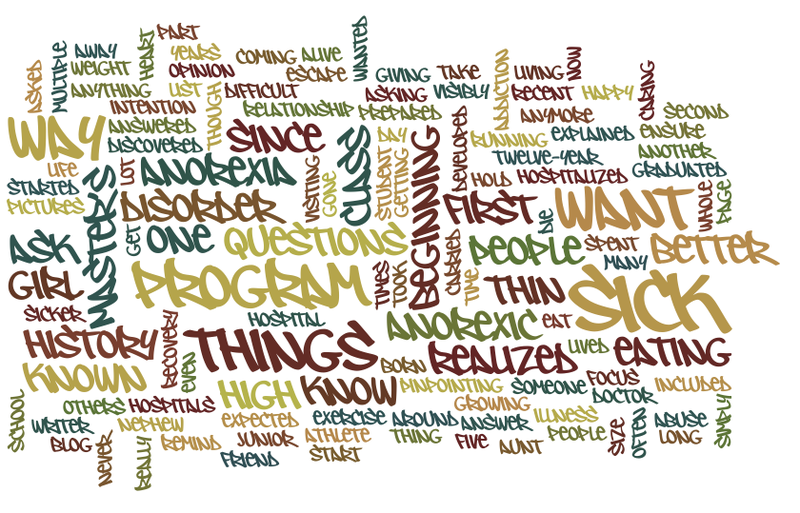 Regarding the anorexia, people ask, “Why did you get better?” At first, I did it to prevent other people from grieving my death. Then, I did it for me. I did it for me because one day, someone asked me what I was doing. I answered, “I’m in a Master’s program.” But then I realized: I wasn’t in a Master’s program. I was in the hospital. For the second time since I had started that program. Even when I was in class, I wasn’t really in class. I was 2% student and 98% anorexic. I realized I didn’t want to be known as “that girl” or “the sick girl” anymore. If I was going to live, I wanted to really and fully live. I wanted to be known as a writer, a friend, an aunt, a teacher, a knitter, and a whole list of other things. I couldn’t do those other things until the anorexic inside of me was gone. This journey of participating fully in life and leaving the anorexia and self-harm behind really is a journey, one that still continues. While I’ve been fully recovered from the anorexia for ten years, I still experience days (or weeks or months) when I wish I could somehow just withdraw from the world around me. Both the eating disorder and the self-harm allowed me to do so, but in ways that harmful to myself and others. Learning how to live life without shutting down is a journey many people, with and without mental illness, struggle with. I also have an extremely rare form of heart disease known as ARVD that basically means the muscle cells of my right ventricle are slowly dying. There is no cure. There is no treatment. This has been influenced by the Bipolar Disorder and has influenced the Bipolar Disorder, sometimes making my thoughts and emotions about each difficult to express. I feel extremely uncomfortable recommending any one form of treatment for anyone, for everyone is different and what works for some will not work for others. I will say one thing: Get treatment. Talk to a professional. Recovery is the scariest thing you will ever ever go through, but it is still much better than being sick. Recovery is a long process, and you deserve support during this time. If you need help finding and accessing treatment please check out this article on how to go about finding a therapist where you live.